Since our engagement, Nate and I kept kicking around different wedding dates. Originally, I wanted to get married in the fall because of the gorgeous leaves we get here in Minnesota. But, the more I thought about it, the less I wanted to wait that long! Next, we started thinking about a winter wedding because of our love of snowshoeing. Before we knew it, it was Christmas…why does that always seem to sneak up on me? After the new year, we started thinking again about making a winter wedding happen this year. Suddenly, we decided on a date that worked for our immediate family and planning started…and ended…pretty quickly. It only took a few days to get all of the details ironed out. 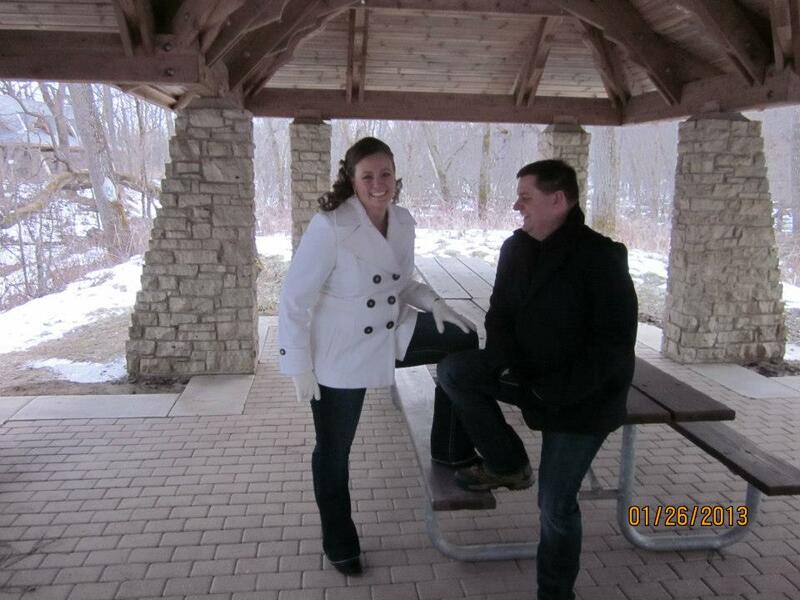 On Saturday, January 26th, Nate and I were married in one of the local parks where we enjoy snowshoeing. We got married in a clearing next to the river, with just our immediate family members present. The temperature was approximately 20 degrees, which was warm considering the week before and the week after were in the single digits! 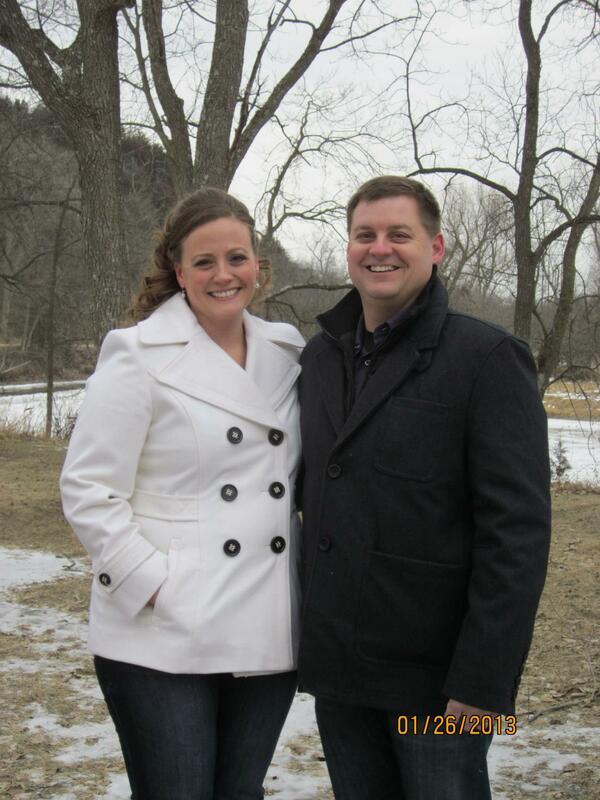 Yes, we got married outside during January in Minnesota! We chose to have an inexpensive and low-key ceremony because it just suits us and we were able to pay cash for everything. Oh, and because I’m not a fan of large weddings or being in the spotlight; for this reason we chose to wear jeans and peacoats. No fuss. After the short ceremony our family joined us at Buca di Beppo, one of our favorite restaurants, for dinner. I’m very grateful to my parents for paying for the dinner. Our cake was a simple sheet cake, decorated with snowflakes. Following dinner, we had our friends and family meet us at a local bar to celebrate the occasion with us. There was dancing, drinking and fun. It was a blast! The turn out to our “reception” was larger than we expected and we are so thankful to have so many friends and family that came out to celebrate with us. We couldn’t have asked for a better day. The total cost for our wedding was less than $1500, which included our wedding bands! We still think we should call the Dave Ramsey show about that. Thank you, Financial Peace University! Friends as photographers instead of professionals. Wore jeans instead of a wedding dress. Chose a restaurant that serves “family style” meals rather than individual plates. Took advantage of the DJ at the local bar for free music and a free reception venue. My fantastic friends were my hair and makeup experts. Utilized Facebook, email and phone calls as invites. 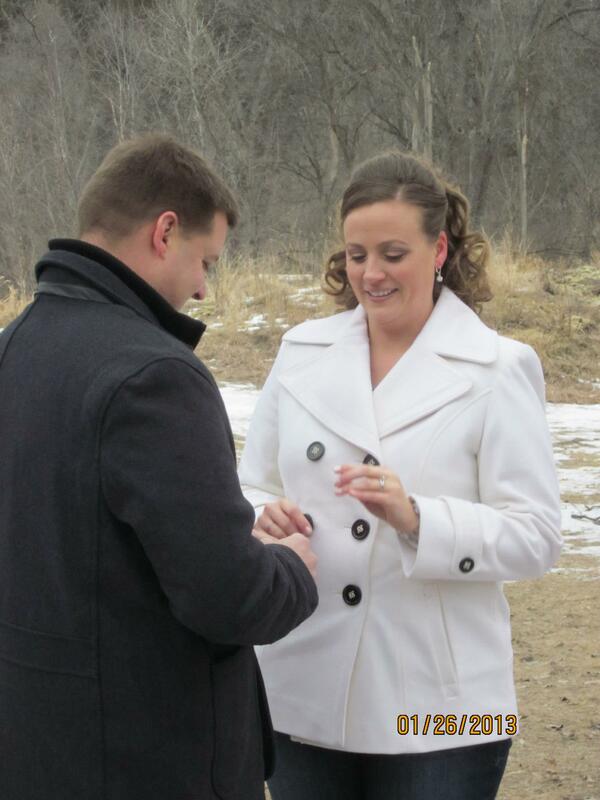 Nate purchased his ring online, where the cost was a small fraction of what it would have been at a jewelry store. Thinking of our friends, we also eliminated costs for them by requesting that they wear jeans (or other casual clothing). We also requested no gifts. The entire day ended up being just as I wanted it to be. Casual, fun and intimate. Something that reflected our relationship and who we are. There isn’t a thing I wish I had done differently. First of all, you are kind of nuts for an outdoor wedding in winter. I’m in Michigan, so I know how the weather can be. However, HOLY COW you looked beautiful and although I’m sure pictures don’t do it justice, the whole thing looks absolutely lovely! I will never get married, but if I did it wound be low-key and exactly the way you described it. So many brides get caught up in what other people want or go into ridiculous amounts of debt for one day. Congratulations! Anytime the wedding really reflects the couple I think it’s a big success.